Sorry I have been a bit lax is posting! 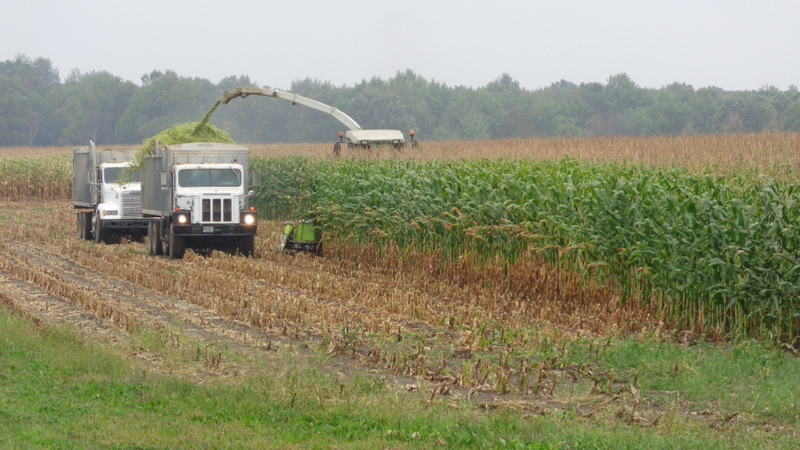 We started chopping corn and are almost complete. 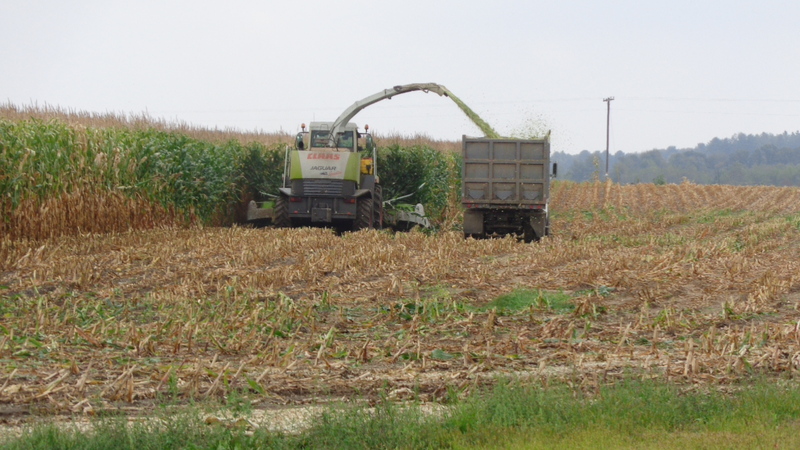 In fact, all we have left to chop is the strips that we have to leave in the field for the crop insurance adjuster. The rain faucet shut off in early July, causing our corn to dry out very fast. Very poor corn this year, a late wet spring, and then drying out in the summer combined to make this one of the worst cropping years that anyone can remember. 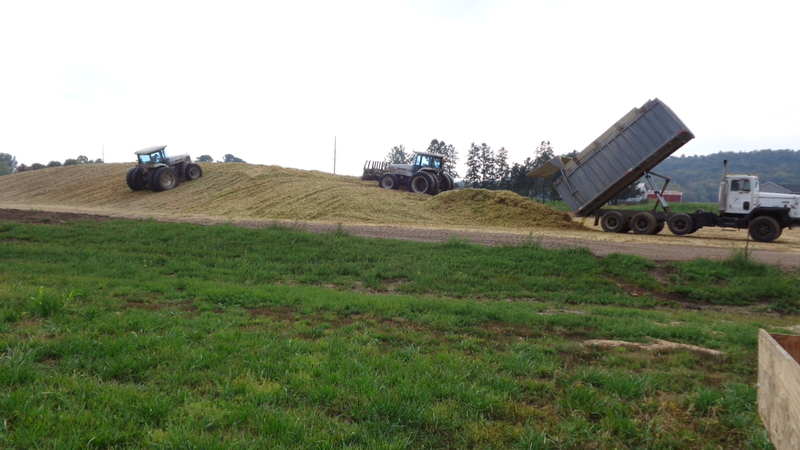 We tried something new for silage this year: a drive over pile. Basically instead of having walls like a normal bunker silo, it is just a flat pad, and you make a pile that you can drive over all sides of. 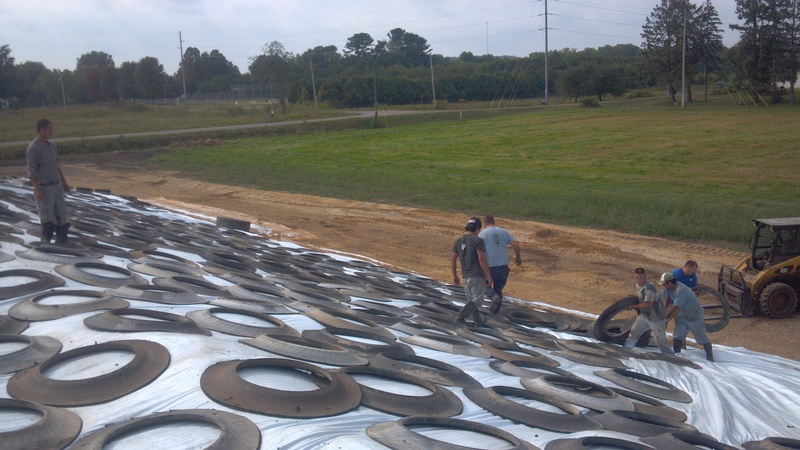 Covering is a labor intensive, we had 12 people involved in covering this pile, and it still took us 4 hours to cover! Each of the rings is 1/2 of a semi tire. They weigh about 30 pounds each, and are all placed by hand on top of the plastic! 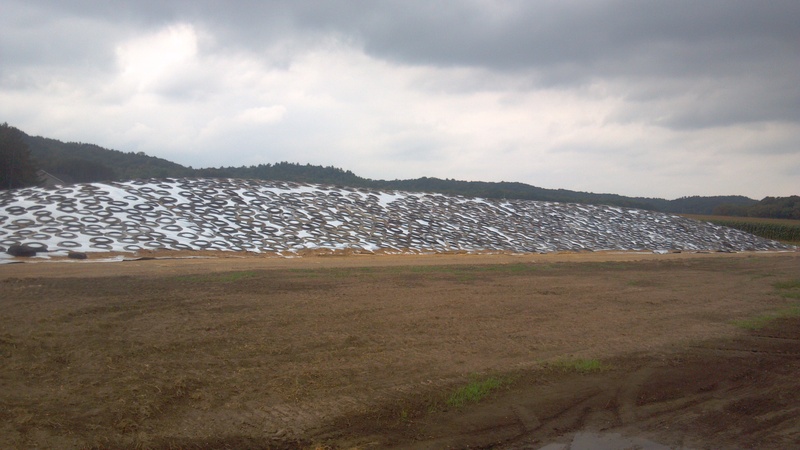 The pile ended up being about 260 feet long, by 95 feet wide, and 15 feet tall in the center. Now we wait to start combining! This entry was posted in Agronomy, Machinery and tagged agriculture, agronomy, bunker silo, claas, corn, cows, crops, dairy cows, dairy farm, dairy farming, dairy farming today, dairy good, factory farming, family farm, family farming, farm, farm animals, farmer, farmers, farming, food production, harvest 2013, John Deere, milk, Modern Agricuture, modern farming, organic farming, production agriculture, Production agricuture, sustainable agriculture, sustainable agricuture, Wisconsin dairy farming. Bookmark the permalink. 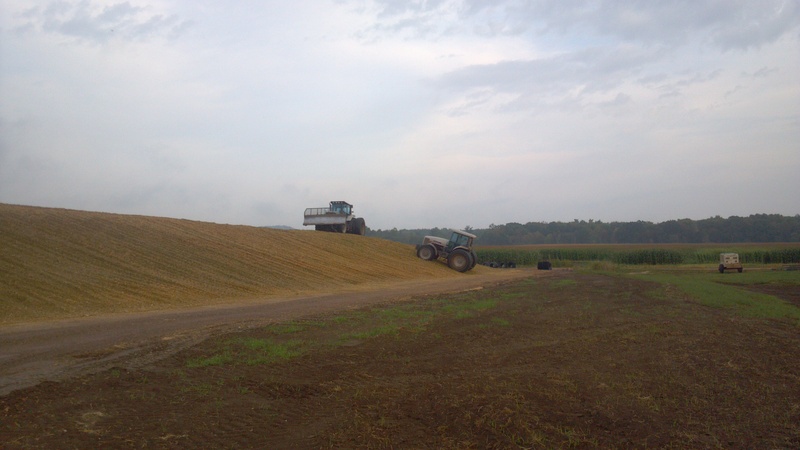 nice pile, do you folks double up on plastic or use silo stop at all? I have seen more of that this year than in the past. Farmers that use either double 5 mil or 2 mil and 6 mil see a lot less spoil. putting it down is a pain though, and of course it will be windy when you do it too. I farmer showed me a used piece of bag last week, he had me get under it and look at the sky through the bag. There were about 100 tiny holes in it. He said that is why he double bags. Every tire that gets tossed wrong or if someone has new boots on it tears a tiny hole in the bag and allows air to move. Yeah we use silo stop or double the plastic on everything now.